Two companies behind a Song dynasty-themed tourist attraction in eastern China are giving their thirty-something single women employees extra time off during the Lunar New Year to “go home and date”. 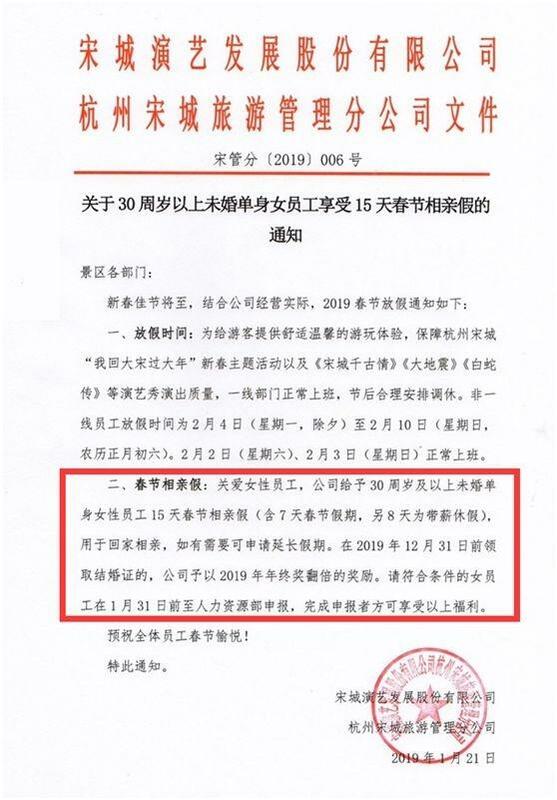 In a notice on Monday, Hangzhou Songcheng Performance and Hangzhou Songcheng Tourism Management said unmarried women over 30 in “non-frontline” roles would be granted an extra eight days of “dating leave” on top of the traditional seven-day break. Those workers also had the option to extend the dating leave, the notice said. As more women focus on careers, many are marrying later or opting not to marry at all. “The ratio of men to women in our company is about the same,” Huang was quoted as saying. The announcement comes after a high school in Hangzhou last week offered single and childless teachers an extra two half days of leave per month to find “love”.